$25,000 price reduction announced on this 68' Princess yacht for sale in Florida! 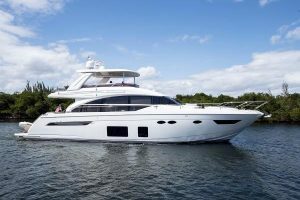 : Atlantic Yacht & Ship, Inc.
$25,000 price reduction announced on this 68′ Princess yacht for sale in Florida! Chris Carroll j ust announced a $25k price reduction on the 68′ Princess yacht for sale! In the first place, this used 68′ Princess yacht was launched in 2015. Equally important is how this yacht is US duty paid. Therefore she ready-to-go for US cruising. Her fly bridge hard top is one of countless options and upgrades that this yacht features. After all, her twin Caterpillar C-18A diesel engines let this boat cruise at speeds in the 30 knot range. Also, with her Seakeeper Gyro stabilization this yacht is sure to impress! As can be seen, this used 68′ Princess yacht is truly fantastic. She features four guests staterooms along with crew accommodations for 2. Her upgraded air conditioning is perfect for tropical weather cruising. And, don’t worry about powering the systems with your two 19kW Onan generators. The freshwater maker, premium audio system, satellite TV, and underwater lights add to the package. In fact, fresh bottom paint and Prop Speed was just applied in March 2017 along with new carpets. With a Yacht Controller remote system and bow & stern thrusters this yacht is easy to control as well. For more information on this beautiful used 68′ Princess yacht be sure to contact Chris Carroll today! For over 56 years Atlantic Yacht & Ship has been serving the yachting community. Our headquarter sales office is dockside at Harbour Towne Marina in the heart of the yachting capital of the world, Fort Lauderdale, FL. Our in-house waterside service department provides general yacht services. This includes from new teak, to engine rebuilds, captain services, and everything in between. Whether purchasing or marketing a quality vessel, Atlantic Yacht and Ship, Inc. is your one stop resource for the highest quality service and sales in the yachting industry today. If you are looking at yachts for sale, or thinking about selling your yacht, it is always wise to have an experienced broker representing your interests throughout the deal. Contact Atlantic Yacht & Ship at 954.921.1500 or click here. $10,000 Price reduction on this beautiful used 68′ Princess yacht for sale in Florida! New price reduction on this beautiful used 68′ Princess yacht for sale! MAJOR price reduciton on this beautiful used 68′ Princess yacht for sale! Just listed: a beautiful used 68′ Princess yacht for sale in Florida!